At Willamette, physics students tickle atoms with light and freeze molecules to explore quantum physics, analyze data on galaxy motions to increase our understanding of the Big Bang, and wield lasers to explore the inner workings of molecular motor proteins. The physics department’s large number of ongoing research programs is rare for a small liberal arts college like Willamette. 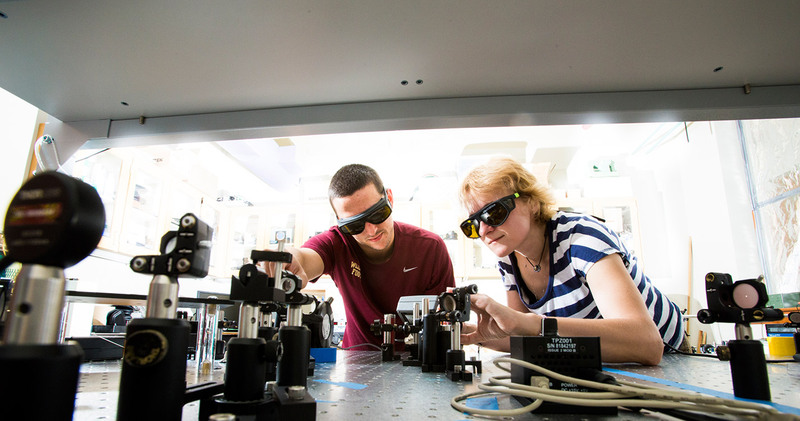 A state-of-the-art optics training laboratory, funded by a $200,000 grant from the National Science Foundation, prepares students to carry out meaningful research. Through projects that often start in their freshman year and culminate in a full senior year of independent research, students enjoy the exceptional opportunity to hone their skills in experimental and/or computational physics. Our students leave Willamette well prepared for careers in industry or academics. Willamette is a great place for those who want to pursue Engineering but still get a well-rounded education. The 3-2 Engineering program allows students to get both a BA from Willamette and a BS from Columbia, University of Southern California, or Washington University in St. Louis. Many of our graduates choose the one-year, Master's Industrial Internship Program at the University of Oregon as their path to a career in industry. All of this takes place in Willamette’s renowned, friendly and collaborative environment. Faculty members mentor, inspire, and challenge students in small classes at all levels, from introductory physics to upper-level specialty topics courses. Students curious about how things work will find answers here. The knowledge, skills and experience they acquire will open up a world of exciting possibilities in diverse career fields.